Big Wins At The Paralympics Change Attitudes About Sport And Disability In India : Goats and Soda Its athletes have won two golds, one silver and one bronze so far — an unexpected burst of excellence. 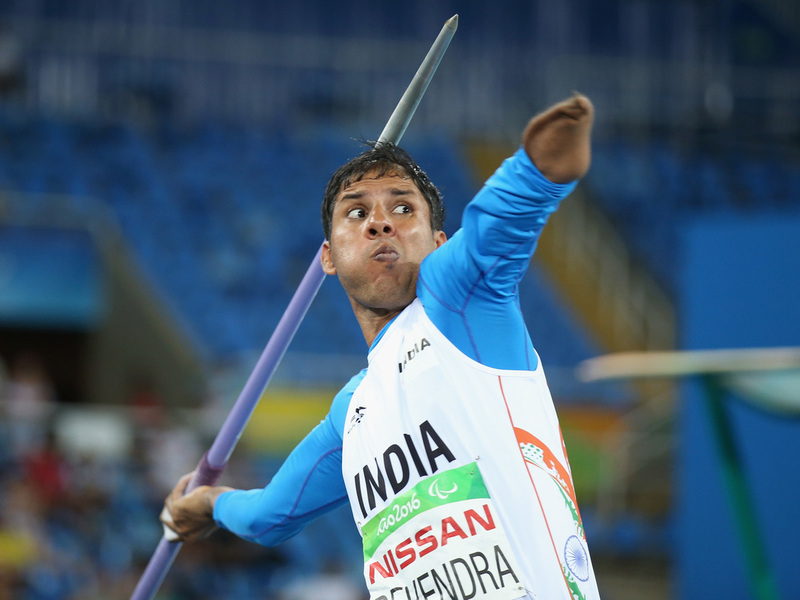 Devendra Jhajharia of India competes in the javelin throw at the 2016 Paralympic Games. The gold medal winner lost his left arm in an accident when he was 8. Deepa Malik was about to make history. Seated in a custom-made chair on a hot day in Rio, Malik — paralyzed from the chest down — held a 6.5-pound shot put between her neck and right shoulder. She took a deep breath and hurled the shot 15 feet across the throwing circle. The throw got Malik a silver at the Paralympic Games in Brazil this past Monday — and made her the first Indian woman to win a Paralympics medal. "My first thoughts were, 'Oh my God, have I really won?' " says Malik, 45, via email. She developed a spinal tumor in her early 30s and has been paralyzed since. "To become the first Indian woman to win a Paralympic medal is an honor, and it is something I will cherish for the rest of my life." A few days later, Devendra Jhajharia also had a historic win at the Summer Games. When he was 8, Jhajharia touched a live wire in his small North Indian village; his left arm had to be amputated. Everywhere he went, people commented on his missing limb, telling his mother he would forever have to rely on her. Tired of being called weak, Jhajharia was determined to prove them wrong. And boy, did he ever. The 36-year-old javelin thrower just beat his own 2004 Athens Paralympic record and won a Paralympic gold for a second time. "It's fabulous," says Deepthi Bopaiah, executive director of GoSports Foundation, a nonprofit organization that funds professional athletes in India. "This is definitely a great start for India. I think more people will come forward to support these athletes." A year ago, the foundation launched an exclusive program for India's para-athletes, and that program has funded most of the participants at this summer's Paralympics. So far, India has won two golds, one silver and one bronze medal. That's double the success of its 2016 Olympic counterpart of more than 100 athletes. Several factors have led the country to this summer of excellence. For starters, the Indian government recently passed a first-of-its-kind corporate social responsibility law requiring certain companies, based on their earnings and revenue, to contribute 2 percent of their profits to social development — including education, poverty and sport programs. "It's really changed the game for us," says Aparna Ravichandran, head of partnerships at GoSports Foundation. Since its inception eight years ago, the foundation has relied on the support of individuals and small organizations, but this recent mandate has resulted in funding from multinational companies and other large partners. The government also launched a "Target Olympic Podium Scheme," an initiative that has set aside a little over 300 million rupees, or more than $4 million, for the program. These cash incentives have made a world of difference to athletes — several of whom are from extremely humble backgrounds. They also convey to a society that's biased toward academics that sport can be a legitimate and lucrative career. "They're able to see money," Bopaiah says, adding that athletes can win hundreds of thousands of dollars through sponsorships as well as rewards from the government. For instance, the government of Tamil Nadu in southern India has promised high jumper Mariyappan Thangavelu 20 million rupees, close to $300,000, for winning a gold in this year's Paralympics. Policy changes have also led to better media coverage and more awareness of the needs of athletes with disabilities. A few years ago, Mahantesh Kivadasannavar, a partially blind cricketer, helped form the Cricket Association for the Blind in India, or CABI, with "the prime objective to focus on promoting and fostering the game of cricket for the blind," he says. This relatively new group — still in need of regular funding — is managed by visually impaired cricket enthusiasts. Para-cricket involves slight modifications to the original sport. For instance, the cricket ball is made of plastic with steel ball bearings on the inside that rattle, letting the batter know of an approaching ball. Also, cricket wickets are made of steel instead of wood. In a country that worships cricket, CABI helps select 17 visually impaired cricketers from a group of roughly 10,000 hopefuls to represent India at international events — including the second annual T20 World Cup cricket tournament for the blind scheduled for early next year. Kivadasannavar is also part of the Indian Association of Para Sport Organizations — a recently formed coalition of like-minded groups and agencies. The group is the brainchild of Rajesh Tomar — former president of the Paralympic Committee of India, or PCI, which has often come under criticism. PCI's parent body, the International Paralympic Committee, suspended the organization several times in the past few years over internal conflicts as well as mismanagement of athletes and events. Only recently did the international arm lift its ban on PCI, allowing athletes to represent India at this summer's Paralympics. The poor planning manifests itself in other ways, too. "There's not much help in terms of sending in their entries, paying their entry fee on time, getting their visa, getting their travel documents processed on time," says Ravichandran of GoSports. In addition, despite some improvements, athletes continue to struggle with a lack of handicap-accessible infrastructure and access to appropriate training facilities in India. "The deeper we got into that ecosystem, the clearer it became that there's so much more support needed," she says. Some of that support comes from coaches and other role models, who have already walked this somewhat confusing and challenging path. Niranjan Mukundan can vouch for the power of a good coach. Born with a spinal defect and a club foot, this 22-year-old swimmer was crowned junior world champion last year at the International Wheelchair and Amputee Sports event in the Netherlands. It was "one of the best moments of my life," he says. When Mukundan was 8, his coach, John Christopher, from Bangalore, introduced him to the world of para-swimming. Less than a year later, Mukundan participated in his first national event and won a silver medal. When she isn't out winning medals for her country, Malik serves as a motivational speaker and a role model, hoping to inspire people through her journey. "I think it is important to lead as an example," she says. "Now, with my latest achievement, I hope to strike a chord with people back home — particularly differently abled women in India — and inspire them to come out of their homes."